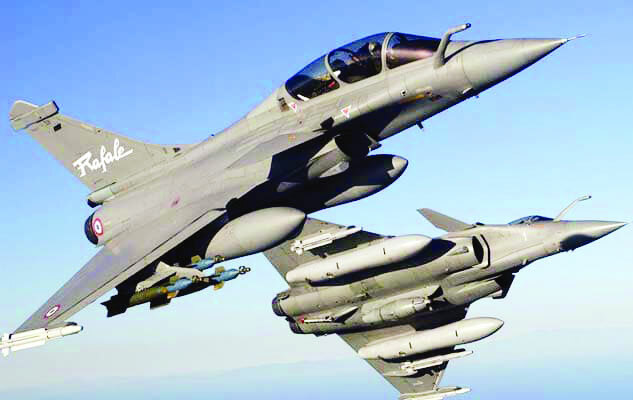 Rafale will stick to the Government like the Sikkim leech, especially after Former French President François Hollande’s Anil Ambani bombshell which France and Dassault have rejected for fear of losing the Rafale contract a second time. The Congress will make Rafale the Modi Government’s Bofors. Both are excellent weapons. No one has questioned the calibre of the equipment but only its cost, the alleged scam (Rs 41,000 crore) including offsets. The Government is relying on Modi’s corruption-free image, his credibility and the aam aadmi’s confidence in him. The Congress after voter-data analysis has discovered that the highest level of curiosity item is Rafale. The Congress will launch nation-wide protests covering every State, district and block, and submit petitions seeking a probe. It has already sought a Joint Parliamentary Committee (JPC) and urged the Comptroller and Auditor General of India/Central Vigilance Commission (CAG/CVC) for an early report. A PIL for an independent probe into procedural irregularities is to be heard in the Supreme Court on October 10. Innovative protests, like paper aircraft and balloons representing Rafale, will go up in the air. A team of elders, former BJP stalwarts and lawyers are quizzing the Government with embarrassing regularity, accusing Prime Minister Modi of “gross misuse of office in personally orchestrating purchase of 36 Rafale while scuttling a deal for 126 aircraft…and his storm-troopers issuing lie after lie”. The following conversations are recalled: Defence Minister Manohar Parrikar said to Doordarshan: “Modiji took the decision, I backed it up” he said three days after Modi’s surprise announcement in Paris on April 10, 2015. Foreign Secretary, S Jaishankar briefed the media on April 8 and said, “Prime Minister does not get involved in ongoing defence contracts.” The fourth Defence Minister, new to her job, Nirmala Sitharaman in November 2017 asked Defence Secretary Sanjay Mitra during a media conference to spell out the cost details, which he did not or could not do, whereas comprehensive off the record briefings on costs had already been done by MoD officials in 2016 after signing of the contract and later, spelt out by both Ministers in Parliament. On July 20, 2018, during the no-confidence motion debate, Sitharaman waved an expired confidentiality agreement with Dassault in Parliament to protect details of the cost. The Government has tied itself in knots on cost and 14 India-specific enhancements, insisting that their Rafale is nine per cent cheaper, whereas the Opposition is asking how the price helicoptered from Rs 670 crore to Rs 1,660 crore. Five main issues are repeating: Cost and scam; reduction of aircraft numbers from seven squadrons to two squadrons; forfeiture of ToT and Make in India; sidelining of Hindustan Aeronautics Limited (HAL); and awarding offsets to Anil Ambani. The first allegation can only be resolved by CAG/CVC. The key issue is enhancing the combat capability of the Indian Air Force (IAF). If the Government had secured a cost-effective deal, why did it order only two and not three or four Rafale squadrons, the Congress is asking? According to NDTV, letters were exchanged between two Defence Ministers about ordering additional Rafales, like was done for Mirage 2000. In an absurd claim, Sitharaman justifying the Government’s contract for two squadrons — based on precedent — told the media that IAF cannot absorb more than two squadrons due to lack of infrastructure and other technical considerations. This is churlish as sufficient time of six to seven years is available to create infrastructure in airbases 1,500 km apart at Ambala and Hashimara. Equally preposterous is the Minister’s claim in an interview to the PTI, denouncing HAL for its lack of capacity to build a Rafale. Former head of HAL, Swarna Raju, has countered this by saying that they have made over 2,000 aircraft — 250 Vampires, 300 Gnats, 700 MiG 21s, 165 MiG 27s, 115 Jaguars, 99 Hawks, 272 Sukhois and 150 Dorniers. A public critique of HAL will do little good to its morale and reputation. On offsets, much has been said by Sitharaman, Hollande and Dassault. Dassault is certainly free to select its Indian offset partner but the Defence Ministry has to vet the choice. The most tragic part of the ongoing debate is the Government’s politicisation of the IAF — this after the Army’s surgical strikes were being used as vote-catcher. Senior IAF officers were unsubtly used during a seminar on IAF: Force structures 2035 to defend the Government’s stand on Rafale with journalists from Print and electronic media outnumbering analysts. But questions on Rafale by the media were stonewalled. Journalists whispered that the IAF was not happy being goaded by the MoD into speaking up on Rafale. In a Swachh Bharat, the Government and the Opposition washing their dirty linen in public does no good to national security, especially for a Government which advocates Sabka Sath Sabka Vikas. But sadly, modernisation and other grievances of the military were sidelined. The internecine campaign of Press conferences must stop by the Government agreeing to a JPC. Sitharaman, while rejecting the JPC, wanted a probe as to why 126 aircraft deal could not be consummated during the UPA era, suggesting middlemen’s involvement. Insulting the workforce at HAL, insinuating counter scams by injecting the AgustaWestland appear to be diversionary tactics obfuscating procedural deviations as if there was something to hide. The Italian court has ruled out fraud and bribes in the AgustaWestland case. Instead of 126 Make in India, 36 Rafale will be made in France, surrendering vital ToT. In order to fast track numbers of combat squadrons, the shortfall from the cancelled 126 aircraft contract in July 2015, the Government has had to repeat the MMRCA 2007 tender process in April 2018 for 110 multi-role fighters incurring time and cost escalation. What the UPA was unable to do, the NDA should have done — the last mile in the marathon. But instead Modi allegedly short-circuited established procedures for emergency purchase of 36 Rafale. In the political slugfest, the IAF is left high and dry. It is intriguing how Dassault chief Éric Trappier having said on March 14, 2015, days before Prime Minister Modi’s Paris announcement, that he expected the contract to be signed shortly with HAL collaboration, changed his mind. After the Hollande Rafale revelation, it seems either a former French President or an incumbent Indian Prime Minister (who is still silent) is being economical with the truth. Introducing foreign hand is a fatigued ploy. Coming clean on Rafale should lead to a truce which is urgently required for the IAF to resume breathing normally and India’s emerging power reputation not being dented any further.